Easy-go-grasp signature Oball geometric holes are fun to pick up and easy for inexperienced little fingers to grasp and hold. Don't let the eyelashes fool you - these girly cars are rugged and ready for playtime! These cars are perfect for even the youngest of race fans! 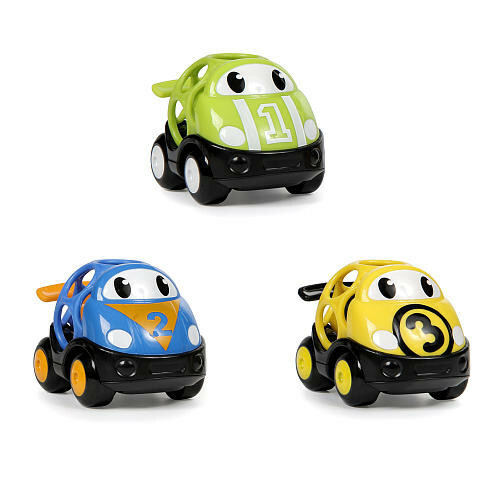 Oball  GoGrippers  Vehicles Race Cars  feature those signature Oball geometric holes that are more fun to pick up and easy for even the youngest, most inexperienced fingers to grasp. These easy-to-grip cars are rugged and virtually indestructible. They roll easily and interact with all Oball GoGrippers  toys and play sets. Great for on the go and inspiring more imaginative play times. 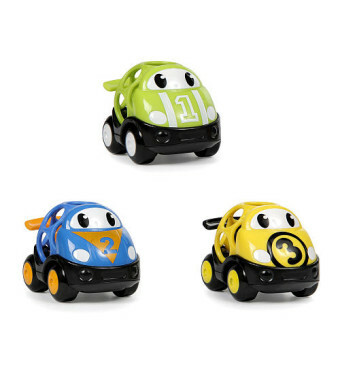 These brightly colored cars are so easy to pick up, they're the ideal choice for baby's very first car! • Easy-go-grasp signature Oball geometric holes are fun to pick up and easy for inexperienced little fingers to grasp and hold. • Don't let the eyelashes fool you - these girly cars are rugged and ready for playtime!